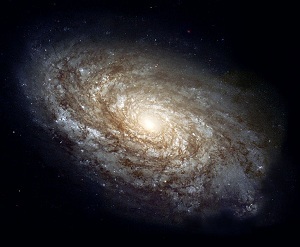 Image: The spiral galaxy NGC 4414, as imaged by the Hubble Space Telescope. Can simulations help us understand how a galaxy of hundreds of billions of stars can be explored by a single civilization? Credit: NASA. Yesterday’s look at radiation and its effects on humans in space asked whether any Fermi implications were to be found in the work described at the University of Rochester. One answer is that expansion into the cosmos does not need to be biological, for biological beings can build robotic explorers equipped with enough artificial intelligence to get the job done. A truly advanced civilization would be able to create large numbers of intelligent probes or, indeed, self-replicating probes that could spread throughout the galaxy on a timescale of perhaps ten million years. Read more: Dynamics of an Interstellar Probe — Centauri Dreams.